Ozone Greens: Premium luxury encompassed by spectacular features for a life of eternal bliss! Chennai is a beautiful city in Southern India that has a lot to offer its inhabitants. There is a lot to this city other than what meets the eye. The real estate industry in Chennai has grown to a great extent over the past couple of years and has a lot to offer in terms of residential and commercial projects. Ozone Greens is one of the latest township projects in Chennai by Ozone Group that is packed with rich features for a sophisticated lifestyle. Extended over luscious acres, this township development consists of vibrant towers that offer splendid variants of 1BHK, 2BHK, 3BHK and 4BHK luxury apartments that are designed to delight! The apartment area sizes start at 651 sq. ft. and go up to 2570 sq. ft., providing ample luxury space that will always keep you smiling. Ozone Greens Chennai is an extravagant development that offers premium luxury and comfort from head to toe. The apartments are spacious and contain grand fixtures and fittings, vitrified flooring, ceramic flooring in utility areas and balconies, plush kitchens with granite tops, powder coated aluminium windows and MDF/flush doors, high-quality paint on internal walls, intercom facility and more. Experience modern-day living that will be loved for generations to come! The external amenities at this development are truly outstanding and include a clubhouse, well-equipped gymnasium, meditation centre, swimming pool, multiple sports facilities and a play-area for your kids, party hall, library, crèche, multipurpose hall, landscape garden, boulevards, optical fibre cable (OFC) internet connectivity, wide open space, 24hour water supply, firefighting systems and power back-up for emergency situations and 3-Tier security for total safety. This development also takes-up rain water harvesting to save water and help the environment. 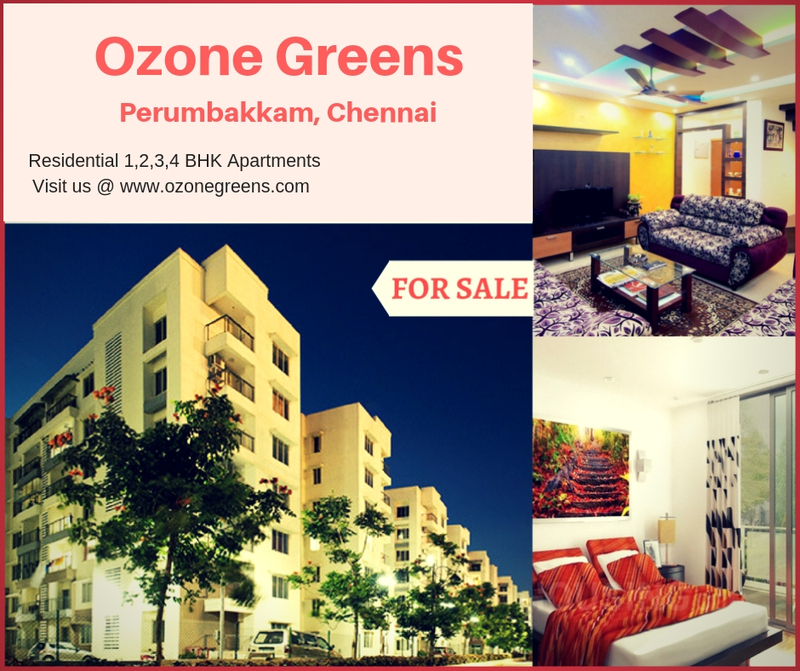 Located at Perumbakkam in Chennai, Ozone Greens Perumbakkam comes in close proximity to a number of your daily and emergency landmarks and offers a new level of convenience that will satisfy your soul. Places like schools, institutes, malls, cafes, shopping centres, cinemas, restaurants, general stores, banks, ATMs, medical centres, hospitals, all kinds of public transport and a lot more can be found and accessed without the need of traveling for hours. Starting at a price of Rs.27.34 lakhs and going up to Rs.1.07 Crs*., the Ozone Greens price is simply fabulous and affordable. Without a doubt, an apartment at this development is definitely worth a buy. You can choose from multiple payment options along with home loan features through associated banks, NRI services and more. Live life to the fullest at this township of pure divinity. Your Review... We have bought a flat in F2 tower of Phase-2. We are quite happy with the compact layout of the flat and its specifications. We had a very smooth and professional interaction with their Sales & Marketing team, particularly the co-operation extended by Mr. Mohanraj and Mr. Anandapadmanabhan. We would recommend this project without any hesitation. Very good project near by OMR connectivity, Very good water source... only CMDA Approved projects for that particular project.